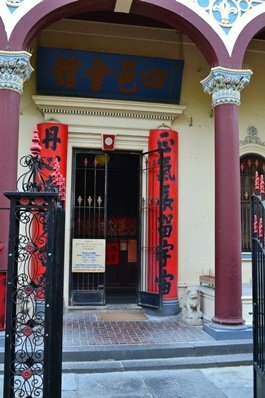 The See Yup Society temple at Raglan Street in South Melbourne was designed by George Wharton and replaced double storey wooden lodgings constructed in 1855 and a temple dating from 1856. The fund for the construction was raised by compulsory donations from the Society Members at that time. The names of more than a thousand donors are inscribed on two stone tablets at the Temple. 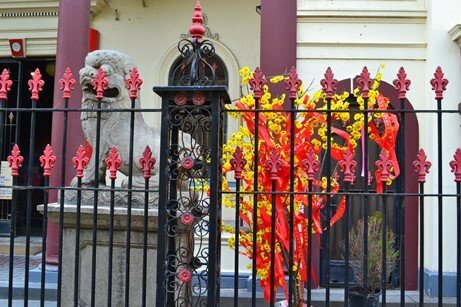 The temple design blends European and Chinese elements, as the building and associated fences are in style of the classical revival enhanced by contrasting oriental detail and statuary. The temple has two altars for worship and three memorial halls. The 1866 construction had only one memorial hall. In 1901 a second one was built, designed by Harold Desbrowe Annear. A third memorial hall was built in 2004. The temple served as the principle centre of worship and death registry for the Cantonese in Victoria. 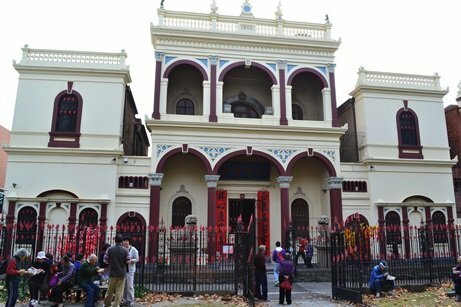 Dating from the early 1850s, the death records of 13,000 Chinese-Australians; their names, Chinese districts and villages are kept at the memorial hall. In 1978 the temple was registered by the Australian Heritage Commission as a building of historical and architectural importance. Although the temple has placed a notice at the entrance saying all visitors are welcome with the donation of a gold coin, the temple doesn’t encourage non- Chinese visitors. No wonder a temple of such historic significance do not find a deserving place in Australia’s tourism manuals. Major restoration work was undertaken at the temple in 1974 with financial assistance from both state and federal Governments. Restored temple was opened to public in 1976. The See Yup Society was started in Victoria in 1854. Siyi or See yup refers to the four districts of Xinhui, Taishan, Kaiping and Enping in the Pearl River Delta of southern Guangdong province in China where the members came from. The traditional beliefs of See Yup immigrants incorporated Confucianism, Taoism and Buddhism. In the 1800’s the See Yup society campaigned for better mining conditions and welfare of Chinese migrants. The centre acted as social and spiritual centre and it also paid for aged and ill Chinese Diggers to sail back to China. The temple is open seven days a week and conducts Chinese language classes and acts as a social centre for the See Yup Chinese. 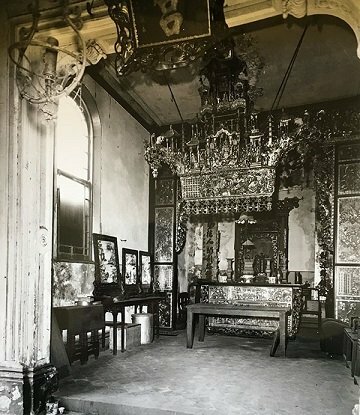 It remains a main site of prayer and remembrance for the Chinese community in Victoria Opened to the public in the 1970s, the temple has become a treasure to all those interested in the history of the See Yup Society and its contribution to Victoria. Tram No 112 has stop near by. This topic contains 0 replies, has 1 voice, and was last updated by Administrator 4 years ago.